Toward 2020 and beyond, Toyo University established a Toyo University Special Research Project Grant Program for the Olympic and Paralympic Games in FY/AY2017. This Program is aimed at offering financial assistance to cover the costs of research projects at the University that are expected to contribute to the Olympic and Paralympic Games Tokyo 2020. The system embodies the determination of the University, which boasts outstanding achievements in sports and is engaged as a general university in research in a wide range of academic fields, to unite all its energies to impart its intellectual resources to wider society to contribute to the Tokyo 2020 Games. We recognize that Toyo University has a mission to promote research projects that are expected to create new innovation in fields such as “Fostering athletes through life innovation (science and technology in the food and healthcare fields)” and “Further enhancing accessibility (development of parasports and achievement of an inclusive society by utilizing the advantages of the Paralympics)” and impart their results as a legacy to be bequeathed beyond 2020. Based on this recognition and in line with our Toyo Sports Vision, we will continue to actively promote research activities. ?Development and application of a practical educational program aimed at fostering the understanding of preschoolers about disabilities using parasports? Daily conditioning of athletes is indispensable for their training and should be managed in consideration of not only differences between sports but also the influence of exercise load on each athlete’s body. Some athletes are unable to appropriately judge the most basic management of their physical condition, resulting in misjudgments. To address such challenges in conditioning management, this research project establishes a general physical checkup station for athletes and provides them with support, allowing them to continue to appropriately manage their condition. In this project, the electronic medical records (EMRs) of athletes, including information about their physical, biological, behavioral, and mental condition, will be obtained and offered to the athletes themselves or their coaches to help manage their condition. In addition, use of the EMRs will help to enhance the quality of athlete training and performance. Moreover, with a view toward contributing to society, physical measurement technology and the method by which general physical checkup stations for athletes are run will be disclosed publicly in 2020. During the Tokyo 2020 Games, many people from inside and outside Japan will visit Tokyo. This research project focuses on providing a platform that enables mobility in the most suitable form for each of those with diverse attributes, including people from abroad, those with disabilities, and the elderly. In addition, an advanced pedestrian navigation system linked to this platform will be developed and disclosed publicly. The more people that use this system, the higher the amount of data it will store, resulting in obtaining more accurate information. This project to create an environment where everyone can move freely and smoothly at will using a civic participation-based system will help foster positive public attitudes toward mobility assistance and achieve a sustainable society toward 2020 and beyond. Japanese canoe athletes currently use canoes made in East European countries, which are the leading countries in canoeing. 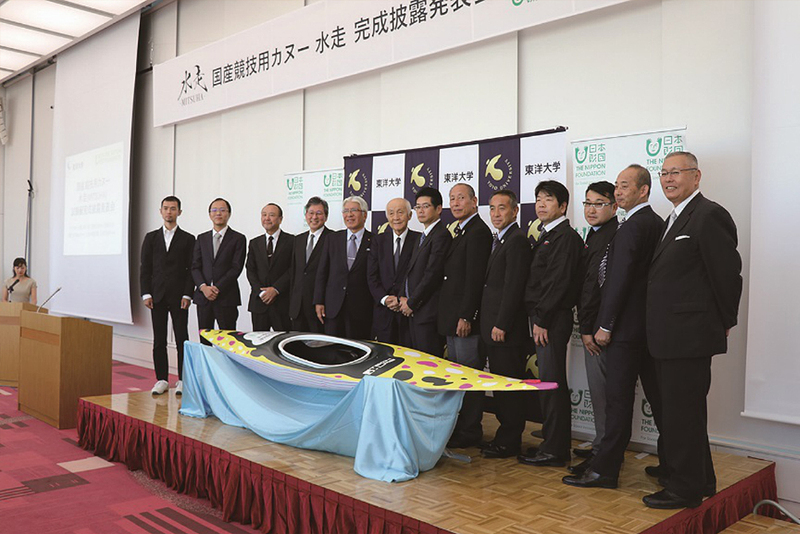 This project aims to create a first-ever Japanese-made racing canoe that fits Japanese athletes’ physical build, to help them to accomplish remarkable achievements at international meets. The shape of the canoe was designed with fluid-dynamical and biomimetic technologies, while the cockpit was designed based on human engineering. The project team was ultimately able to develop the MITSUHA, an innovative model of canoe that overturned conventional ideas about what a canoe is supposed to be like, and unveiled a completed prototype in 2018. Test-paddled by top Japanese canoe athletes, the prototype is now in the final adjustment stage, to be further improved in preparation for actual use in the Tokyo 2020 Games. Since the Tokyo 2020 Games are scheduled in the metropolis’s hottest season, from July to September, measures for athletes to cope with the heat stress are an important factor that will determine whether or not they can achieve their best possible performance. This research project aims to develop foods and beverages that function to protect the blood vessels by adding natural substances that are effective against the heat. The project team has analyzed the substances to be added using an experimental system with cells and animals that is designed to evaluate their effects, and then plans to test ingestion of these substances in humans before launching them onto the market in FY2019. The completed foods and beverages are expected to allow athletes to address the heat during the Tokyo 2020 Games. In addition, with a view to contributing to wider society after the Tokyo 2020 Games, the project team is considering using the products to help the general public maintain their health, including preventing frailty in the elderly. The “female athlete triad” is a collective term for three interrelated problems caused by continued rigorous training: low energy availability, menstrual dysfunction, and osteoporosis (decreased bone mineral density). Internationally, in the field of sports medicine and science emphasized the importance of preventing and responding to this triad problem appropriately. This research project is developing an original educational program through collaboration between sports medicine, sports science, and nutritional science. To solve the problem of low energy availability by facilitating changes in female athletes’ own awareness about conditioning, with the aim of achieving early detection and prevention of the female athlete triad. Enabling female athletes in particular and to acquire the highest level of ability to compete, requires training from junior stage, in which considered as the most essential period. Learning appropriate dietary habits and bone formation, as well as understanding the importance of junior stage for the coaches and athletes are highly needed. It can be said that the fruits of this project will lead directly to success in the strategic training of Japanese athletes from the junior stage and increase their ability to compete. Education plays an important role in creating a better understanding of disabilities and achieving a greater mutual recognition of diversity. This research project aims to develop an original preschool educational program related to parasports, and implement it at nursery schools, kindergartens, and centers for early childhood education and care throughout Japan in order to contribute to disseminating education about the Paralympic Games and developing education to better understand disabilities. This educational program is to be developed based on factual surveys and implemented on a trial basis. Its effectiveness will be verified through surveys of preschoolers, their parents or other guardians, and nursery/kindergarten teachers, before the program is completed as a tool that can be distributed to nursery and preschool educational institutions. Approaches focusing on the education of preschoolers will help to increase interest not only from the children but also their parents/guardians to attain a better understanding of disabilities. The Olympic and Paralympic Games host country and cities have a mission to effectively use and develop competition venues and urban facilities constructed for the Games even after their closing. This research project aims to examine, from the perspectives of both tangible infrastructure and intangible systems, how we should promote the construction and use of barrier-free facilities in Japan using the Paralympic Games as a catalyst, and help construct an inclusive regional environment. Research is currently being conducted in the areas of Kita-ku, Shibuya-ku, Koto-ku, and Ota-ku, Tokyo, on themes suitable for each area’s characteristics and needs. Specifically, the project team is now cooperating in drawing up barrier-free-city master plans for each city (ku), surveying and analyzing accessibility to commercial and other facilities, and conducting research on raising children’s awareness about barrier-free facilities. The project team also will conduct fieldwork to examine challenges with previous Games in the host cities of PyeongChang and London, and apply the findings to the current research. An urban or regional environment where everyone is respected without discrimination should be achieved and developed as the most important legacy of the Tokyo 2020 Games. To prepare for the Tokyo 2020 Paralympic Games, tactile paving for visually impaired athletes is currently being introduced into indoor sports facilities. However, many previous studies on tactile paving dealt with how to increase walking safety and comfort, with little interest demonstrated in exploring optimal paving layout. Focusing on this problem, this research project aims to enhance the quality of tactile paving installments and the efficiency of paving installment works, by developing an automatic tactile paving layout using AI technology. To develop an automatic layout generation system, an evaluation model will be created based on simulations using a pedestrian model, and deep learning will be conducted. This evaluation model is an original one that comprises a recognition-related evaluation axle, such as the level of comfort and ease of detecting paving, and a physical evaluation axle, such as the number and attributes of facility users, and relationships between layout and efficiency. The results of this original research based on a humanities?natural science collaboration between specialists in informatics and psychology can be expected to contribute immensely to creating a more comfortable sporting environment. Copyright c Toyo University. All Rights Reserved.